FAMAS stands for Fusil d’Assaut de la Manufacture d’Armes de St-Etienne (Assault Rifle by St-Etienne Arms Factory – a member of the French govt. owned GIAT Industries concern). Development of this rifle began in 1967, under the leadership of the Paul Tellie, a French arms designer. This new rifle was intended to replace in service the MAS Mle.49/56 semi-automatic rifles, MAT-49 submachine guns and some MAC Mle.1929 light machine guns. First FAMAS prototype had been built in 1971. French military began to test this rifle in 1972-73, but, in the meantime, France adopted a Swiss-designed SIG SG-540 5.56mm assault rifle as an intermediate solution. FAMAS rifle was adopted by the French in 1978 and since then became a standard French Army shoulder fired small arm, known among the French soldiers as “Le Clairon” (the bulge). According to the Janes Infantry Weapons 2000, the total number of FAMAS F1 rifles built is estimated at 400 000, and the production of the F1 variant has been completed before 2000. It is still used by the French army, and was exported in small numbers to some countries like the Senegal or United Arab Emirates. Since then, the GIAT Industries developed an improved version of the F1, known as the G1. This rifle featured an enlarged trigger guard, that covered a whole hand, and a slightly improved plastic handguards. G1 was an intermediate design, and was consequently replaced by the latest production model, the FAMAS G2, which appeared circa 1994. This rifle has the G1-style enlarged trigger guard but can accept only STANAG type (M16-compatible) magazines. It was adopted and purchased by the French Navy in the 1995, but French army never get down to adopt it, so overal production was fairy small, about 10-15 thousands total. FAMAS F1 rifles began to receive mid0life update (Picatinny rails, new bipods, forwarg grips etc) in around 2010, but in 2014 all upgrade work has been cancelled in favour of purchasing entirely new rifles of foreign make. Since 2016 well-worn and aged FAMAS inventory is gradually replaced in Fench service with German-made HK416F rifles, although this process could take more than few years to complete. 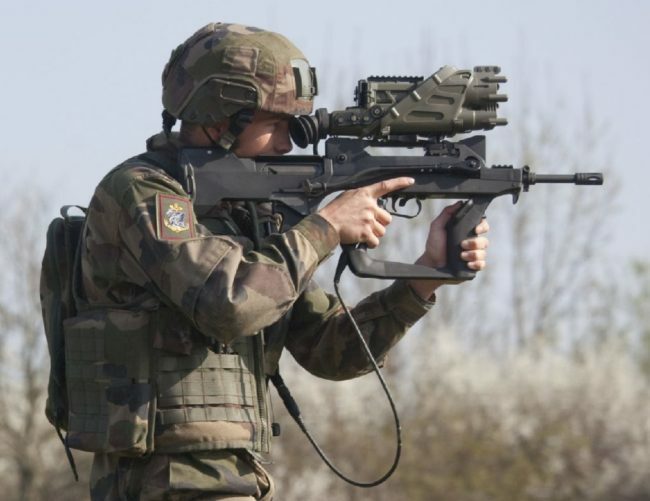 FAMAS rifles also served as a test-bed for small arms part of the FELIN program (Fantassin à Équipement et Liaisons Intégrés, Integrated Infantryman Equipment and Communications). Several thousands of FAMAS F1 rifles were upgraded between 2010 and 2014 to accept electonic equipment of the FELIN system. Among other upgrades, it included new forward grip with supporting bracked at the bottom and the key-pad at the top rear, with several buttons that are used to operate and control onboard electronics. 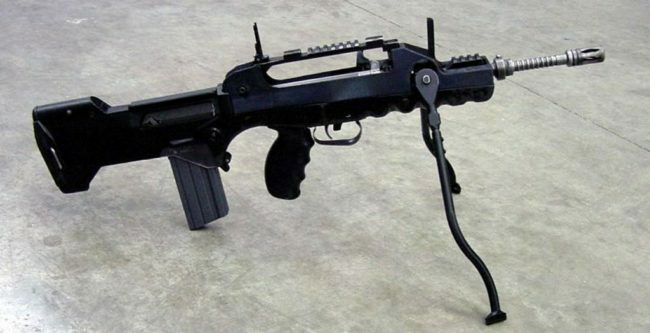 The FAMAS assault rifle is built using the bullpup layout, with the magazine housing behind the pistol grip and trigger. Gun is built around the compact receiver, which is enclosed in the plastic housing. FAMAS is one of the few systems that uses a lever delayed blowback action, borrowed from the French AAT-52 machine gun, but originally invented by the Hungarian designer Paul de Kiraly prior to the Second World War (see 39M submachine gun), and improved by the Paul Tellie for the FAMAS rifle. This system consists of the two-part bolt (breech block) with the delay lever interposed between the light forward part (the bolt itself), which has a bolt face and the provisions for extractor mountings, and the heavier rear part (the bolt carrier). The lever is pivotally mounted on the front part of the breech block (bolt), with its lower legs resting against the cross pin in the receiver and the upper legs resting against the face on the bolt carrier (assuming that the bolt group is in its forward position). Gun is fired from the closed bolt. When cartridge is ignited and fired, the gas pressure against the cartridge base pushes the cartridge case back in the fluted chamber, against the bolt face. The bolt begin to move back under the pressure, but at initial stages of the movement, when the pressure is still high, the delay lever transforms the short movement of the bolt into the longer movement of the heavier bolt carrier, thus delaying the opening of the bolt. As soon as the pressure in the chamber is dropped down to reasonable level, the lever is completely withdrawn from the contact with the cross pin, and from this moment on both bolt and its carrier begin to move back with the same speed, compressing the return spring and extracting and ejecting the spent case. The bolt face has extractor mounting points on both sides, so user can mount the extractor claw on the left or the right side of the bolt, which will result in the left-side or right-side extraction of the spent cartridge cases through the ejection ports on both sides of the gun. One of the ejection ports, which is not used at the moment, is always covered with detachable cheek piece, which can be installed on either side of the gun, as required. This allows to solve the problem of the left-hand use, which is essential for most bullpup rifles. The charging handle is located above the receiver, under the carrying handle, is shaped like trigger and completely ambidextrous. The charging handle does not reciprocate when gun is fired. The standard FAMAS barrel is 488 mm long and has a NATO-standard 22mm diameter flash hider, which also is used to launch rifle grenades from the muzzle. Current FAMAS barrels are rifled with 1:9 twist (1 turn in 228 mm, right hand), so both older M193 and newer 5.56mm NATO / SS109 / M855 ammunition can be fired with good results. Another interesting fact about FAMAS barrels is that it has only 3 groves (while most other rifles have 4 to 6 grooves). The “Commando” variant has the shorter barrel which cannot be used to launch grenades. Both standard and the Commando versions can be fitted with the 40mm M203 underbarrel grenade launcher, if required. Every FAMAS rifle (except for the shortest “Submachine gun” version) can be fitted with folding, non-adjustable lightweight bipods that can be folded along the gun body when not in use. On most rifles these bipods are fitted as a standard. Every FAMAS rifle is equipped with the carrying sling and with detachable bayonet. FAMAS F1 rifles use proprietary 25-round magazines, which are not compatible with STANAG magazines.